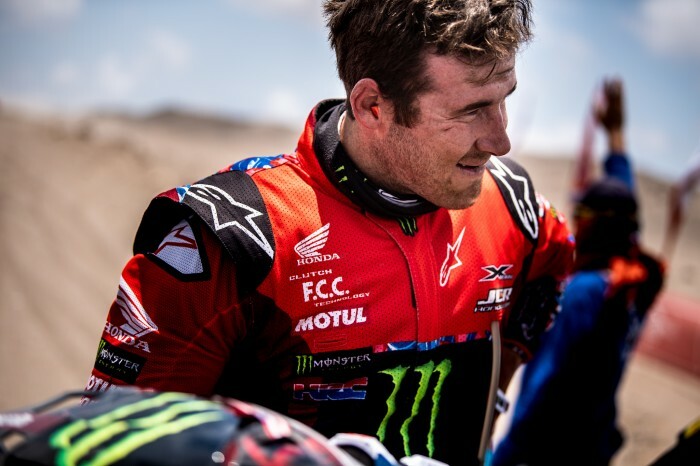 Dakar 2019 overall leader Ricky Brabec was forced out of contention on day eight when the engine on his Monster Honda let go for the second year in succession. Brabec had ridden an almost-flawless race until he began the long eighth stage but was left heartbroken as his he and his Africa Twin was helicoptered off the beach. “It was a really hard day. There was nothing really positive about my day, especially for the race. The coolest part was getting a helicopter ride along the beach and back. It’s heart-wrenching. Not easy,” said the American.